Scott Beal won a 2014 Pushcart Prize for his poem “Things to Think About.” His poems appeared in Rattle, Muzzle, Union Station, and the anthology UncommonCore. His first book of poems will be published by Dzanc Books in 2014. 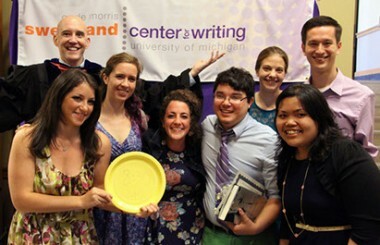 His chapbook manuscript, The Octopus, was named a finalist for the David Blair Memorial Prize. Last year, Tim Hedges received two Pushcart Prize nominations, one for a short story and one for an essay about teaching. He spent four weeks last spring in Wyoming at the Jentel Artist Residency Program, and he continues to spend his summers teaching at the Northfield Mount Hermon School in Massachusetts. His fiction recently appeared in Split Lip magazine. Jamie Jones published an article called “The Moroccan Front” in The New York Times Civil War series, Disunion. The article recounts the role of US-Morocco foreign relations in the American Civil War. This fall, she also participated as a discussant at the International Institute’s Symposium on Island Studies: “What is the Future for Islands?” Last summer, she began working with a research team at the Chipstone Foundation in Milwaukee to develop resources for college instructors who wish to teach American literature alongside material objects and artifacts from U.S. history. Gina Brandolino’s essay “God’s Gluttons: Middle English Devotional Texts, Interiority, and Indulgence” was published in the Summer 2013 issue of Studies in Philology. Julie Babcock’s poetry appeared or is forthcoming in Plume, h_ngm_n, Gingerbread House, and the forthcoming anthology Feast from Black Lawrence Press. Her manuscript Autoplay was a finalist with BatCat Press, and her poetry reviews appeared in Rain Taxi and The Collagist. 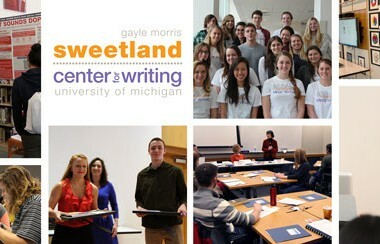 This summer she helped examine and refine the standards for Sweetland’s Minor in Writing Program. Lila Naydan collaborated to present “Castles in the Sand: Building Communities in Times of Change” at the 2012 International Writing Centers Association Conference; two workshops at the 2012 National Conference on Peer Tutoring in Writing; and “What Difference Does Disciplinarity Make in First-Year Writing?” at the Fall 2013 EDWP Colloquium. Simone Sessolo presented his research at the symposium “The Future of Writing Centers,” at the University of Texas at Austin in February. He recently submitted an article version of his presentation, “Violence in the Writing Center,” to The Writing Center Journal. Raymond McDaniel presented a paper at the Associated Writing Programs Conference in Boston on the role of persona in contemporary poetry. He will also be presenting at this year’s conference in Seattle on the topic of “difficult” writing, and at the International Conference on Narrative at MIT on the topic of genre exhaustion and illustration in the work of Hiroaki Samura. Paul Barron was awarded a 2013 LSA Excellence in Education Award. He also presented at the 2013 Conference on College Composition and Communication in Las Vegas on the Dissertation Writing Institute and serves on the Minor in Writing Committee. Jing Xia received her Ph.D. in Applied Linguistics at Arizona State University, where she specialized in English as a second/foreign language writing. She joined Sweetland in 2013 fall. She presented a poster at the Technology for Second Language Learning conference in October. Carol Tell published a review article, “In Gratitude for all the Gifts: Seamus Heaney and Eastern Europe” in the Irish Studies Review (November 2013). She also had an essay, “Utopia in the New World: Paul Muldoon’s America,” reprinted in Literary Criticism. Louis Cicciarelli presented “Dissertation Writers and the Value of ‘Not-Knowing’”at the Conference on College Composition and Communication in Las Vegas, NV on March 16, 2013 as part of the session “The Visible Dissertation: Graduate Student as Writer and Programmatic Efforts in the Dissertation Writing Institute” with Paul Barron and Konstantina Karageorgos.